I hate flowers! I’ve tried to not be a brat in the past whenever I receive them, but that all came to an end this Valentine’s Day. I got not just 1 box of half-dead flowers, but 2! I was going to restrain once again, and pretend that expensive dead flowers are my favorite, but luckily my kids are getting old enough to tattle-tale. As soon as my 5 year old saw the flowers he got so excited and explained how he had helped Daddy pick them out. Are you flippin serious? My gifts are now based on how many points they can earn to purchase virtual dinosaurs? If that doesn’t scream I-PAD addict, I don’t know what else does! So if you were planning on buying your wife, mom, or whoever crappy flowers so you could get virtual dinosaurs – STOP right now! 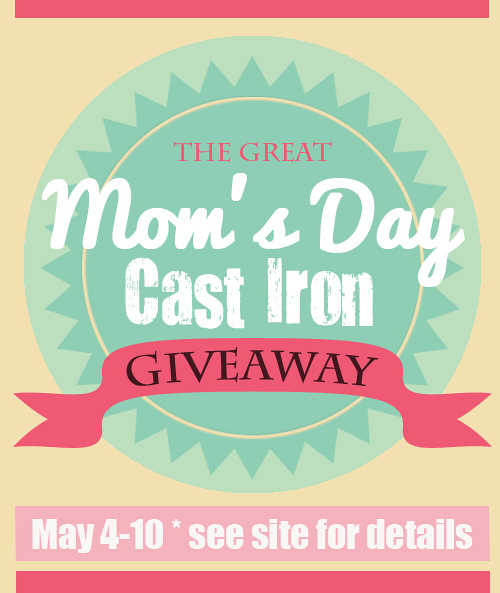 After you check-out some of my favorites make sure you enter mom (or yourself) to win our Favorite Cast-Iron Dishes! A group of awesome bloggers decided to pool our money and have a giveaway like no other. Who wouldn’t LOVE to have some LODGE Cast Iron products for Mother’s Day? We are all trying to be prepared for the unexpected, and what better way than to have a fabulous set of LODGE Cast Iron products in our emergency prep stash! Please be aware, these are the products we have chosen. If these items are unavailable when the giveaway closes out we will substitute with other LODGE Cast Iron products that are similar. We believe and trust the quality of LODGE and this is why we have chosen these products as a our Giveaway. We have no control if LODGE were to discontinue or sell out of said products. The giveaway starts on May 4th at 5:00 am MDT and runs through May 10th 5:00 pm MDT. The winner will be chosen and emailed to contact us within 48 hours. Please check your spam on your emails. If we do not hear from the chosen winner after the specified 48 hours a NEW winner will be chosen and notified (and that would just be sad). This giveaway is open to all individuals 18 years of age and older who live within the 48 Continental United States. I know what you mean about the dead flowers. lol My husband learned real fast. =) Now, he’ll get me live plants that I can put in the garden or just take me shopping. That works! I don’t know how many times I’ve told my hubby give me a gift certificate to get nails done, a facial, a massage, whatever, but it’s always flowers! Flowers are an easy, thoughtless gift for the gift giver. I’d rather receive a gift with a little more thought involved. Me too Susan! Or even if they just got something off my list I’ve taped to their forehead – that would work too! For me, some of my best gifts have been power tools! I’ m on my 11th ( seriously not exaggerating) heart necklace! I’ve even threatened separation should another one appear… I’ve given my preparedness wish list ( with websites, phone numbers and prices!) to no avail!!! I’m cracking up! I was just telling my friend how the night before Mom’s day we would do a Wal-Mart run with my dad to buy a heart necklace for mom! I’m sure my mom definitely feels your pain! I too have given lists, sticky’s, pictures, magazine clippings, etc. – and it wasn’t until this year were I finally pulled out the threats it’s seemed to finally sink in a tiny bit ;) Good luck!